Do you belong to our Meat Tribe? Then you’ll agree there’s nothing quite beats a Sunday Roast. All the comforts of home on one plate. Mastering the perfect roast takes time and practice. However, we’ve come up with a fool-proof timing chart to ensure you get it right every time. With an electric Range Cooker from Leisure, it couldn’t be simpler to make the perfect roast, every time. A Leisure Range Cooker takes the heat off in the kitchen - there’s no juggling around baking trays to compensate for the oven being hotter at the top. With a Leisure Range Cooker, each oven can be set to a different temperature so it’s suitable for different aspects of the meal. Never worry about overcooked roast potatoes again. Keep your joint of meat at the optimum cooking temperature with no heat lost due to having to open the door to shift your baking trays around. Your roast dinner will be perfect every time. The benefit of having up to seven hob rings at your disposal becomes clear when you’re steaming your veggies, sautéing your starters and crafting your gravy. Having so many options streamlines the cooking process when catering for friends and family. For this Cheats Guide, we’ll show you all the timings you need to make the perfect roast chicken dinner. This one is for our Meat Tribe, who can’t resist the lure of a freshly roasted chicken with perfectly crispy skin served with good old fashioned roast potatoes. Follow the timings below and you’ll get the perfect roast every time. Take your chicken out of the fridge, allowing it to come to room temperature. If using frozen chicken, ensure it’s thoroughly defrosted by getting it out the night before. If your chicken is still cold when it goes in the oven, it will take longer to cook and won’t be as tender and juicy. Preheat your first oven (the one you are using for the chicken) to 190°C. Top tip: Never wash a chicken. All this does is spread germs around your kitchen. Cooked properly, any bacteria will be killed anyway. Cut potatoes into roughly even chunks and boil for 10 minutes. After 10 minutes, drain (keep the water for the gravy) and allow to air dry. Once dry, add to a roasting tray with a glug of olive oil, season with salt and pepper and give them a good shake. Peel the parsnips and add them (whole) to the tray with the potatoes. Peel and slice the carrots and add them to a saucepan. Once your chicken is at room temperature, sprinkle salt and pepper over your lemon slices, garlic and red onion quarters, then add a glug of olive oil. Mix together with a few sprigs of thyme and insert into the cavity of the chicken. Rub the outside of your chicken with olive oil, add to your roasting pan and sprinkle generously with salt and pepper. Top Tip: For extra juicy breast meat, cook your chicken upside down. The juices will run into the breasts and make them nice and tender. Flip over for the final 30 minutes of cooking and increase the temperature to 220°C to crisp up the skin. Cover the chicken loosely with foil and add to the oven for 40 minutes. Set your second oven to 200°C and allow it to come to temperature. 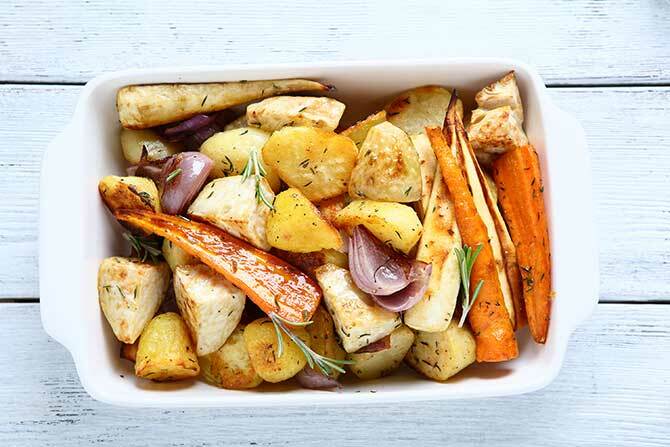 Add your roasting tin of potatoes and parsnips to the second oven and leave them for 40 – 50 minutes, or until you see them crisping up and turning golden brown. Add about half a cup of boiling water to the roasting tray and place the uncovered chicken back in the oven. Take the chicken out of the oven and remove the lemon slices, onions and garlic. Leave these in the roasting tin. Using a wooden spoon inserted into the chicken cavity, gently tip the chicken up so any juices inside run out into the roasting tray. 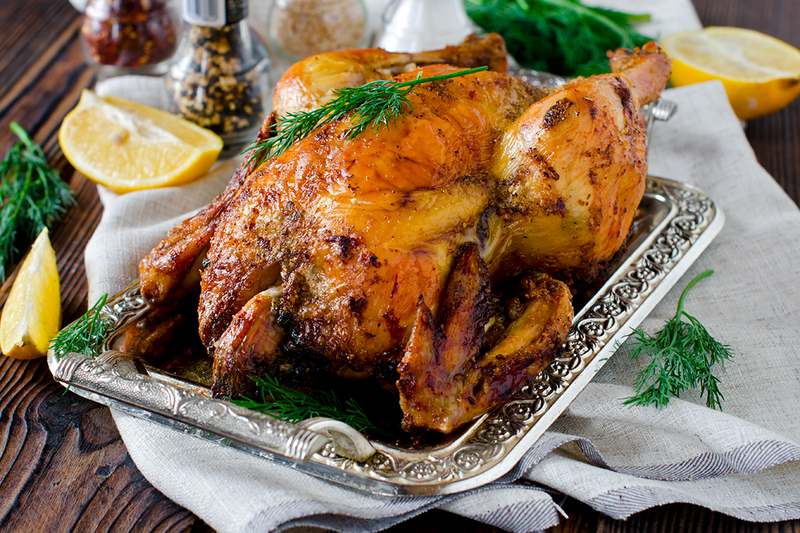 Place the chicken on a chopping board or plate and cover with foil to rest for 10 minutes. Top tip: Allowing your meat to rest gives it time to absorb the juices and makes it tenderer. Add boiling water to your saucepan of carrots and set on the hob to boil for 10 minutes. Take the tray you roasted the chicken on and add 750ml of boiling water to make the gravy (use the water you boiled the potatoes in if you remembered to keep it) and place on the hob. Mix well to ensure all the juices are combined with the flavours of the lemon, onions and garlic from inside the chicken. Bring to a gentle boil, once boiled strain the gravy into a saucepan and place back over a low heat on the hob. At this point, you can add a few spoonfuls of gravy granules or flour to reach your preferred consistency. Remove the carrots from the hob, drain and place into a serving dish. Remove potatoes and parsnips from the oven and place into a serving dish. Decant the gravy into a gravy boat. Remove the foil from the chicken, leave on the chopping board to carve at the table. Bring everything to the table at once, carve your perfectly roasted chicken and let everyone help themselves!